I arrived at Prague Airport and was whisked away down motorways and country roads for an hour and a half. I saw one cyclist on the route. Then, suddenly, we rolled across the town limits of Pardubice, and it was almost like coming home. Bicycles, bicycles, bicycles. 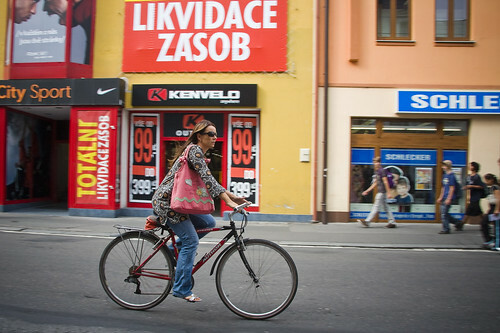 The town of about 90,000 is the cycling capital of the Czech Republic and it shows. 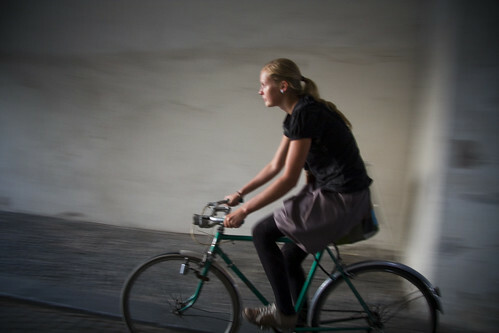 18% of all trips to work or school are by bike and the vast majority of the people on bikes were just regular citizens pedalling about on, for the most part, vintage bikes like the girl in the photo above. It was brilliant. The occasion of my visit was two-fold. Firstly, I was invited to give my lecture at City Hall about Marketing Bicycle Culture. The Danish ambassador was on hand to say a few words. 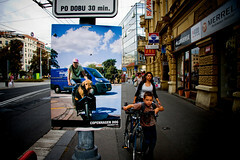 Secondly, there in a street exhibition of 30 of my photos along the main stretch of town. 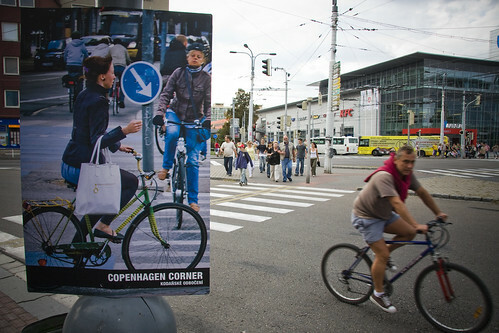 30 photos of a Copenhagen bicycle life. I can't tell you how fun it was to see the photos out in the open like that. In a gallery is lovely, but on the streets is somehow cooler and more appropriate. Images from one urban landscape transplanted into another. 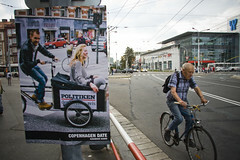 The lecture was, by all accounts, well-recieved and it was wonderful to meet so many Pardubicians of all ages and to discuss how the city can take their bicycle infrastructure to the next level. I was whisked away to Prague, where I had other business the next day and I'll write about that shortly.